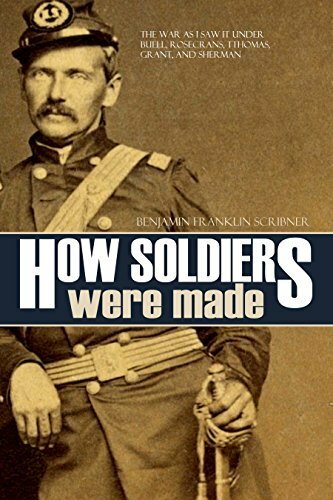 In this volume, Scribner was not trying to tell the exact story of the battles he witnessed but, as he put it, “…to treat the subject in an introspective manner, from a personal standpoint, from the inner life, emotionally and subjectively…” He accomplishes his mission with grace, wit, and humility. When war broke out, Ben Scribner was sickened. He knew what war was, having served in the Mexican-American War. Now the small-town druggist had a family to care for. But he did his duty to his country. Scribner served under a slate of the most famous generals of the war (Buell, Rosecrans, Thomas, Grant, and Sherman). His work is full of anecdotes of episodes with these famous men. He also accomplishes the task of writing as a soldier who knows the close whistle of the minnie-ball and shot.